Head of Iran’s Strategic Council on Foreign Relations Kamal Kharrazi said on Saturday that Iran is ready for talks and cooperation with all regional states in all fields. 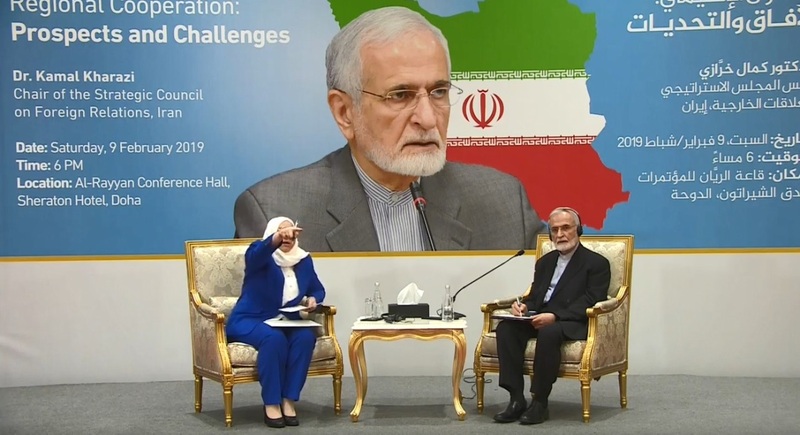 He made the remarks in Al Jazeera Centre for Studies (AJCS) in a presentation on the theme “Iran's Islamic Revolution at 40: Regional Cooperation: Prospects and Challenges” on Saturday, 9 February 2019 (6 – 8 PM) at Al-Rayyan Conference Hall, Sheraton Hotel, Doha. “Our respect to Qatar is a basic issue and its resistance against sanctions is appreciable,” Kharrazi said, noting that interfering in other countries’ affairs is unacceptable. “What we need is political foresightedness and self-confidence,” he said, noting that regional countries should hold talks with each other and take a collective decision to achieve peace and security without others’ interference. He further maintained that Iranophobia led to destruction of certain countries’ wealth and strengthening their ties with the Zionist regime. “Trump’s policies targeted not only Iran but also its European allies,” he said. “We support Hezbollah as it is fighting with occupiers and this caused the Zionist regime to leave Lebanon,” he said.